China And Brazil Warm Up Business, Culture Ties Increasingly, Beijing is using a sophisticated charm offensive in its quest for new markets and resources. It's using this "soft power" approach in countries like Brazil, where it's found a receptive trading partner. And it has a model for its efforts: the United States. 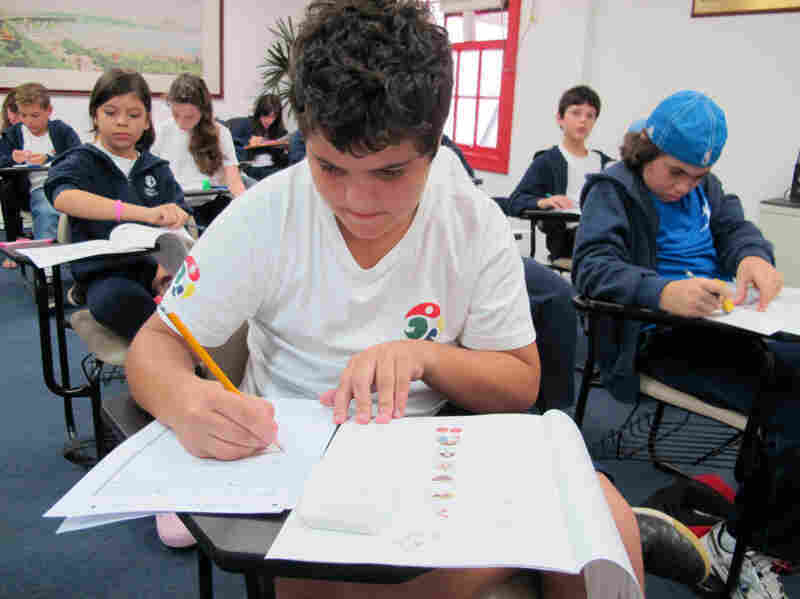 Children in Sao Paulo take a Mandarin-language proficiency class at the Confucius Institute. The institute offers language classes and cultural programs meant to teach Brazilians more about China. In its quest for resources and business opportunities, China needs to have influence in many countries. Increasingly, Beijing uses a sophisticated charm offensive, presenting an image of a modern and dynamic China — a strategy often called "soft power." And Beijing is using the approach even in countries with a relatively good impression of China, as in big, booming and democratic Brazil. It seems that every week, China becomes ever more engaged in one of the world's most important economies. Brazil now exports so much to the Chinese that China has surpassed the United States to become Brazil's largest trading partner. But the Chinese say Brazilian businessmen know very little about their country. That idea led Roberto Blatt, an engineer and consultant who hopes to work with the Chinese, to take classes offered by the Chinese government's Confucius Institute. China has opened these institutes all over the world, offering Mandarin classes, seminars and cultural programs. Blatt is 50, highly educated and fluent in English and other languages. Now he's eager to learn about China. Describing the course choices, he says, "You have many hours of Chinese classes, and also culture, geography, history and culture in general." It's all part of the Chinese effort to draw closer to Brazil. Brazil is vastly different — in popular lore, the land of samba and world-class soccer. Brazil is also Western, democratic and ethnically diverse. But Brazil has what China needs: commodities and natural resources, from soybeans to iron ore, oil to sugar cane. "Brazil is very big, abundant in resources, with a big population and a big market," says Zhu Qingquiao, a business adviser in China's embassy in Brasilia, speaking in Portuguese. 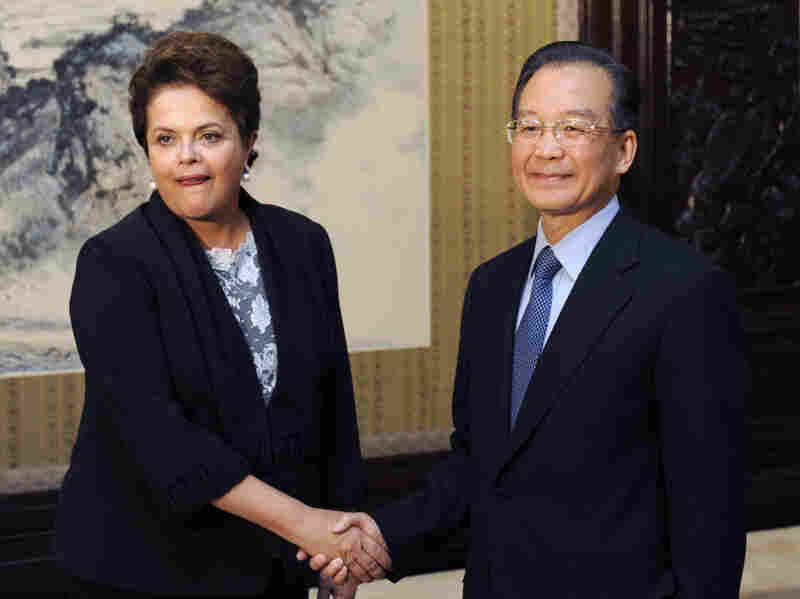 And the economies of Brazil and China are highly complementary, Zhu says. But he adds that it's vital for Brazilian businessmen to learn more about China. Brazil, in other words, is a prime target for Chinese soft power. There's a model for China, of course — the United States, which has sponsored programs worldwide, like those of the Peace Corps. And then there are icons of American culture, such as bluejeans and Hollywood. The Chinese government is now trying to play the same game, educating thousands of Africans in Chinese universities, providing medicine to fight disease in poor countries, and stepping up broadcasts of China Radio International in foreign tongues. In Brazil, many form their first impressions of China from the ubiquitous presence of Chinese immigrants. In Sao Paulo, many of them center on Plaza Libertad and its many markets. After taking office this year, Brazilian President Dilma Rousseff's first major foreign trip was to China, where she met Premier Wen Jiabao in Beijing in April. China has become Brazil's largest trade partner and largest investor. Some Brazilians have delved deeper — like Joao Pedro Flecha de Lima, who directs operations in Brazil for Huawei, the highly successful Chinese telecom giant. "Since I figured I could never learn the language properly, I decided to try to learn a little bit of the culture," he says. "So I read some Chinese romances. And I got a little more acquainted with the way of thinking of the Chinese." Yet those pushing for closer ties to China say that Flecha de Lima is a rarity. Marina Schwartzman works for the Brazil-China Chamber for Economic Development, helping Brazilian companies find partners in China. "They don't know anything about the Chinese language, the Chinese culture," Schwartzman says. So the question, she says, is "How to do business in China if they don't know anything about Chinese people?" A range of groups, some headed by Chinese-born entrepreneurs and activists with ties to the Chinese state, are determined to spur change. In an industrial corner of Sao Paulo, the Chinese Cultural and Commercial Center, headed by a young Chinese-Brazilian businessman named Bob Wei, holds karate classes. And at night, Wei provides briefings on China to businessmen. Across town, in the heart of Sao Paulo, students play the Chinese harp in the Sao Bento school. It's filled with the children of Chinese immigrants, who sing Chinese songs along with the children of Brazilians. Juliana Wu, the principal, is new to Brazil herself. She's found fertile ground here: Brazilian parents. "They want to have their children, in the future, have a good career," she says, "because the one who can speak Chinese and also Portuguese or English ... can get [a] good job." The Chinese government, meanwhile, is building up its diplomatic corps — one that Chinese experts say is increasingly composed of sophisticated diplomats like Shu Jianping. He's the cultural attache here. He's Latinized his name to Antonio, and he's dashing in slicked hair and a blue suit. He also speaks Portuguese and Spanish fluently. 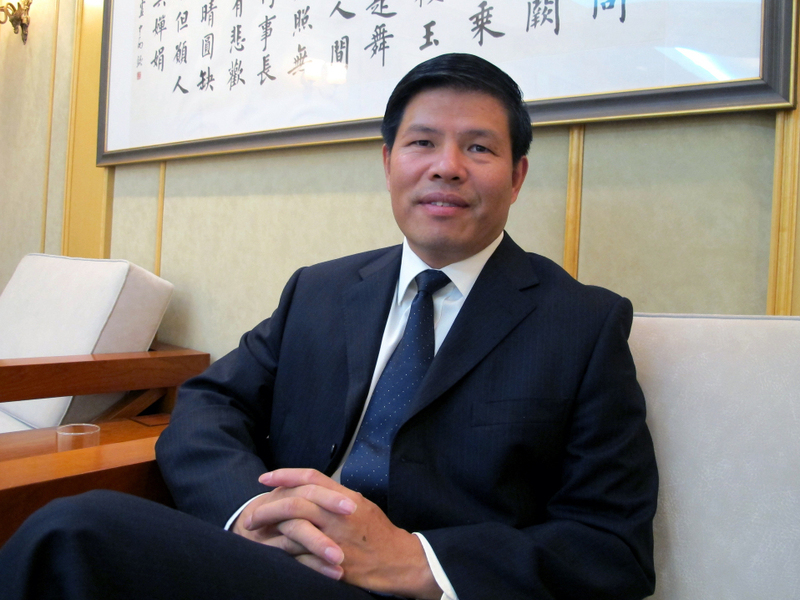 Shu Jianping, cultural attache at the Chinese Embassy in Brasilia, says the goal of China's soft power strategy is for the world to see the country, and its nuances, "objectively." "China wants to be judged objectively," he says in Spanish, "because there are many preconceived notions." Some of those notions are not just notions, such as the jailing of dissidents and censorship. That has given China negative poll ratings in the United States and in many countries that neighbor China. According to the Pew Research Center, a majority of Brazilians have a favorable view of China. But as China's presence has grown here, there's been friction — over, among other things, Chinese imports flooding Brazilian manufacturing. The Chinese want to blunt those concerns. "We have to provide more information to the Brazilians," Shu says, "for instance, about the quality of Chinese goods." Shu says that Chinese products are often criticized as cheap, but they're actually of good quality. To be sure, preconceptions in Sao Paulo are changing because of the latest Chinese arrival — new compact cars sold by JAC Motors. When the cars were featured on TV personality Fausto Silva's Sunday variety show, he called their six-year warranty "unexpected." Sergio Habib, president of JAC Motors in Brazil, has opened 50 dealerships since March; he plans an additional 100 by 2012. "Brazilian image about Chinese products — it's changing very fast," he says. "We are helping that, with JAC cars."